Rhythmic Gymnastics of Indiana: Classes - Experience the beauty of the Sport. We have several class options to better fit your goals and ambitions. Students as young as four years old can start taking classes in Rhythmic. As students improve in their abilities and interest level they will be considered for the Rhythmic team. Team students typically start around six years old and continue their Rhythmic career throughout their teen years. This is an introduction to Rhythmic Gymnastics for the 4 to 5 year old child. The child will learn a variety of jumps, basic gymnastic skills, ballet, and dance. The class will incorporate basic locomotor movements involving different skills and stretches appropriate to the age of the child as well as an introduction to the rhythmic equipment: ball, hoop, clubs, rope, and ribbon. Pre-Rhythmic classes offered offsite and at the Monon Community Center in the summer. This series of classes consist of instruction in basic skills in ballet, dance, and rhythmic equipment. This is an introductory level, familiarizing students with the basic body elements and equipment used in rhythmic gymnastic. Beginner Rhythmic classes are offered at Hamilton County Sports Complex year round and at the Monon Community Center in the summer. At this level gymnasts must show physical ability in performing skills and routines, must be mentally prepared, and posses a positive attitude and work ethic. Team training time will be divided between intense workouts in flexibility, strength, endurance and the mastering of skills with each apparatus. 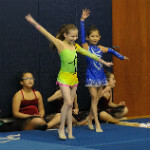 Competitive and Performing Team classes are offered at Hamilton County Sports Complex year round.